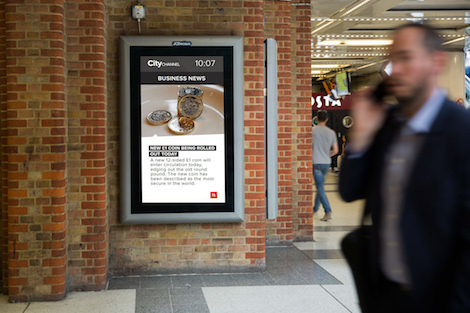 JCDecaux has launched City Channel, bringing business-focussed editorial and data to a commuter audience across rail D6 digital screens in the City of London. City Channel will comprise the latest business and financial news curated by PA (Press Association) and live, financial data (currencies, government bonds, precious metals) from Bloomberg, and weather updates – delivered to screens by JCDecaux Dynamic. City Channel will be shown on weekdays across portrait (D6) screens in London Blackfriars, London Cannon Street, City Thameslink, London Fenchurch Street, London Liverpool Street, London Bridge and London Waterloo stations, across a dedicated content channel, alongside brand advertising. City Channel content is brought to screens through JCDecaux Dynamic’s digital expertise, using the SmartContent platform, delivering 14 million impressions* every two weeks. This entry was posted on Sunday, April 9th, 2017 at 13:41 @612 and is filed under DailyDOOH Update. You can follow any responses to this entry through the RSS 2.0 feed. You can leave a response, or trackback from your own site.